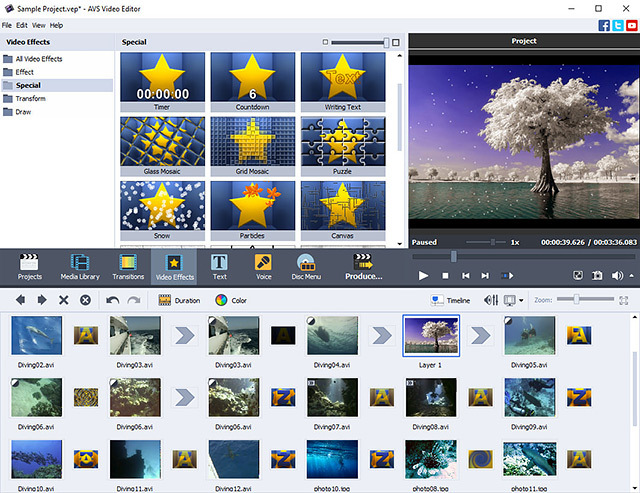 AVS Video Editor supports all key video formats. Edit & save video files in AVI, VOB, MP4, DVD, WMV, 3GP, MOV, MKV, using popular codecs H.264, MPEG-4, H.263 etc. Process video with different frame sizes: HD, Full HD, 2K Quad HD and 4K Ultra HD. Trim, cut, split, merge, rotate and mix videos with AVS Video Editor. Select between 300 innovative video effects and transitions. Insert menus, audio, text comments and subtitles. Stabilize video camera shaky recordings. Edit AVI HD, WMV HD, TOD, AVCHD, MOD, MTS/M2TS, etc. Due to the integrated video cache technology, HD-video editing becomes faster. Transfer video from DV/HDV cameras, webcams or VHS cameras and save video on hard drive or burn DVD discs. Record media files from your PC screen and create video guides, training videos or demos. Capture memorable events and turn them into amazing slideshows. Import images, add your voice or favourite audio tracks, captions and impressive video effects and transitions. Tell your story in different ways: save the newly-made video in the desired format on your computer, burn a DVD/Blu-ray disc, adjust video for your iOS and Android devices or publish your creative work in social networks. AVS Video Editor is a part of AVS4YOU.com package. Register once at avs4you.com and work with all tools from the AVS4YOU.com package. Subscribe for $39/year or $59/lifetime.